Sept. 20, 2016, residents of the Sheridan School District passed a 3.8 millage increase, bringing the millage from 32.2 mills to 36 mills. A total of 2,576 people voted for the increase and 1,722 voted against it. The facilities plan and costs (broken down by the state's funding cycle) are shown below. Click here for a printer-friendly version. 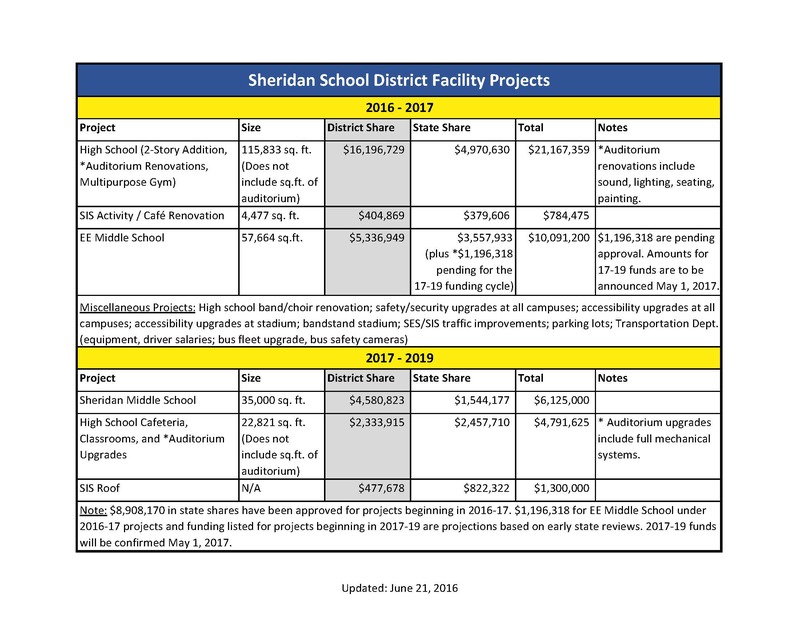 SHERIDAN SCHOOL DISTRICT WILL BEGIN CONSTRUCTION ON MISCELLANEOUS PROJECTS, WHICH CONSIST OF SHORTER-TERM PLANS FOR FACILITY IMPROVEMENT, AS EARLY AS THE SPRING OF 2017. SHERIDAN SCHOOL DISTRICT WILL BEGIN CONSTRUCTION ON MAJOR FACILITY PROJECTS, WHICH CONSIST OF LONGER-TERM PLANS FOR FACILITY IMPROVEMENTS, DURING THE SUMMER OF 2017. DURING THE FALL AND WINTER MONTHS OF 2016, FACULTY AND STAFF WILL BE TOURING FACILITIES AT OTHER DISTRICTS AND PROVIDING FEEDBACK TO ADMINISTRATION ON WHAT DESIGN ASPECTS WILL BEST FIT THE DISTRICT'S NEEDS FOR TODAY AND FOR YEARS TO COME. 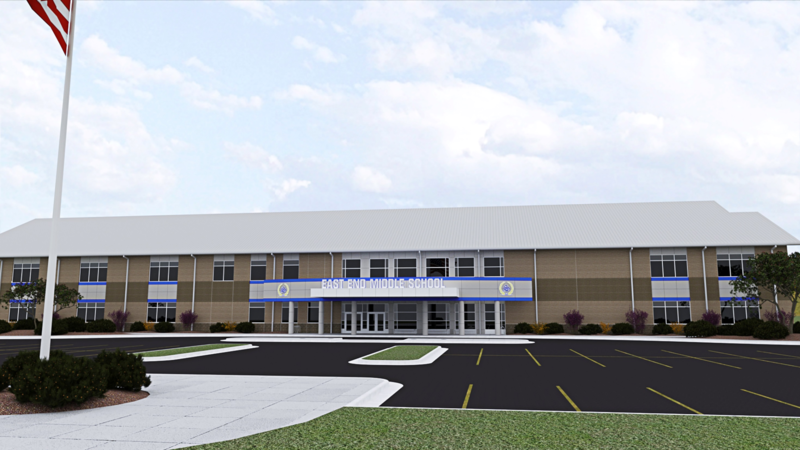 Click here for more renderings of the new high school addition. Click here to see floor plans for the new East End Middle School. 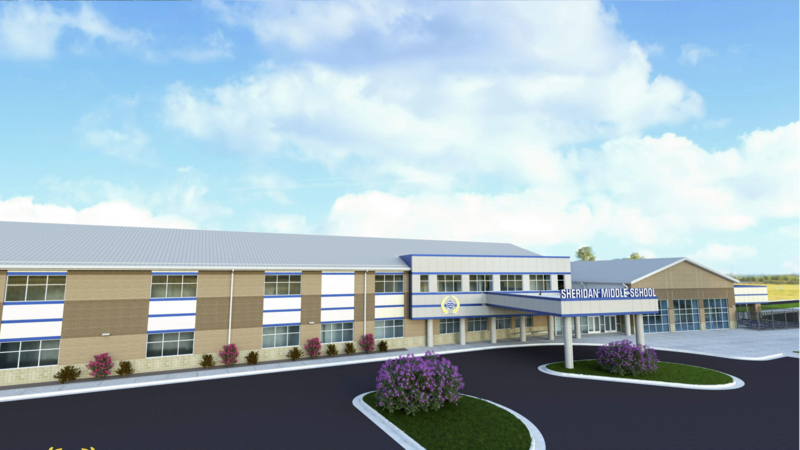 Click here to see the renderings and floor plans of Sheridan Middle School. As a result of a Request for Qualifications selection process that began in October of 2016, the Sheridan School District School Board selected Lewis Architects of Little Rock (approved Nov. 17, 2016) and Nabholz Corporation (approved Dec. 12, 2016) for the district's facilities projects. 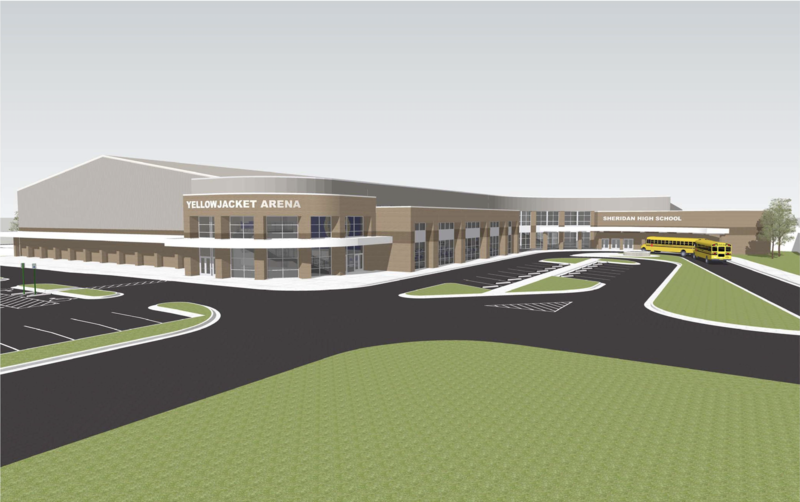 Updated renderings of the major facilities projects will be posted to this page as soon as they are available.